Who here has relentlessly torn their kid's play or effort apart on the ride home from the rink? I've even done that after a practice. Ridiculous, right? But, I'm sorry, any youth hockey parent that claims they haven't *ever* done this sort of thing is full of sh!t. Hey, we all know we shouldn't and I'd bet that every single one of us feels bad during the awkward silence that follows. And, I didn't wake up this early on the weekend so you could do Fortnite dances on the ice! The least they could do is make it look like they're trying out there, right? You know, teach them to take advantage and grasp the opportunites we're able to provide to them. It's certainly not meant to be a put-down session. I won't judge you if you still do that on every car ride home. Practices included. Your reasons are likely justified and I'm not one to tell you how to parent or pretend like it'd be better if you just sugarcoated everything. But if you're one of those parents that gets physical, threatening, or really out of control, drill sergeant style, yes, I will judge you. You're doing it wrong. Seen it, failed to report it, and still feel like crap about it years later. I won't make that mistake again. 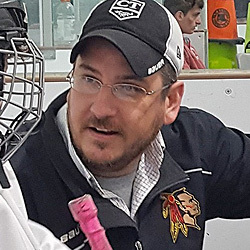 There is a line and if you've been around the youth hockey scene for a few years, you've undoubtedly seen that line crossed outside locker rooms, in arena lobbies, and in the parking lots. Put it in perspective -- they're kids playing in what are essentially meaningless games. After reducing my oldest to tears on numerous occasions in the privacy of our car -- sometimes going so far that his younger brother, just tagging along, started to tear up too due to my verbal assault that wasn't even directed at him -- I now try to limit my criticisms to two things, at most, per ride. My oldest has gotten to the level where, often times, there isn't a whole lot that I can criticize that the coach hasn't already addressed after the game or during practice. He's a second year squirt. These days, I'm pretty limited to mundane reminders like "don't get beat inside -- force them to try to go around and beat you outside to the post" or "the minute they look down at the puck, poke check or lay them out." This past weekend, he was on the ice and directly responsible for all 3 opposing goals against. He knew it. I didn't need to say a word. He knew it. It's been a welcome change -- for both of us. In years prior, it's was more of a wide ranging maniacal "What are you doing out there?!?" rant that was overflowing with enthusiasm (and expletives) but really short on advice. And while I'm self aware enough to know that he still dreads that portion of the ride home, he isn't reduced to tears anymore and I think he knows, now, that I'm genuinely trying to help him become a better player. "Okay, Dad." is his go-to response. The key here is, while I'm a-okay with parents critiquing the crap out of their own kid's play, it works a lot better when you limit it. Pick something specific, harp on it a bit, and then that's it. Follow-up with talking about Fortnite, Pokemon, or Teen Titans Go, or something that interests them. Change the subject. Move on. 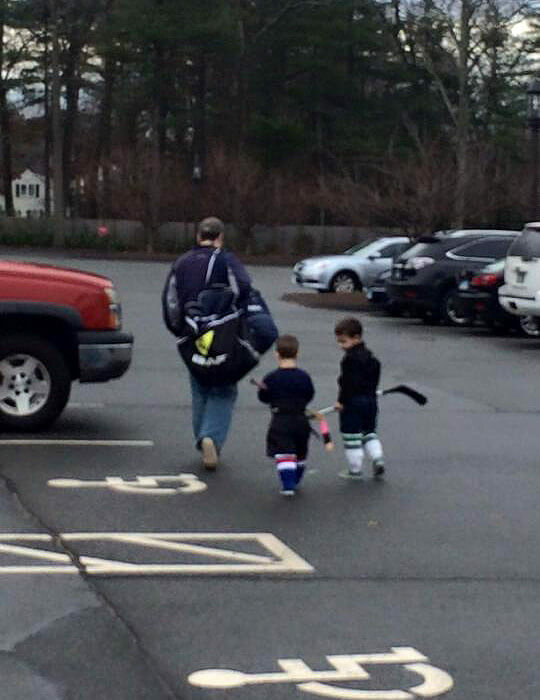 For my middle son, a mite, our talks are usually before games and practices instead of after. They're more reminders on how to play rather than critiques of how he already played. One of the topics is always EFFORT. Effort is more of a wide ranging topic than a specific one but, like I said above, mite hockey is really easy. The kids that excel at that level are the kids that put in a little more effort. You just need to try hard, all around -- that's all it takes to make me happy. Be serious for the next two hours. Don't fool around. Hands to yourself. Listen to your coaches. No one-touch possessions. Carry the puck. Don't just throw it away blindly. Forecheck. Get in there! Don't get caught just watching. Please don't be the last one dressed or un-dressed in the locker room. Stick down, on the ice, and stick-handle in front. Pull the puck back or take a stride forward before you shoot. Don't forget your water bottle on the bench. I think the 'two topics per ride' tactic is working better than the path I'd originally gone down with my oldest son, though, it's also pretty likely that none of it matters at all anyway since my middle son is at that age where he won't listen to me anyway. For my youngest, just getting started as a three-year-old, the one thing I ask over and over and over is, "Are you sure you don't have to go to the bathroom?" His drive is entirely his own -- striving to be like his older brothers -- so I don't need to weigh him down with anything.